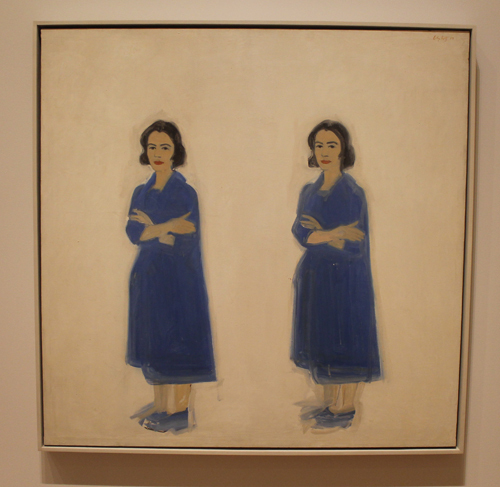 Brand-New & Terrific: Alex Katz in the 1950's is the largest museum exhibition to showcase Alex Katz's (b. 1927) innovative portraits, landscapes and still life form this pioneering period. 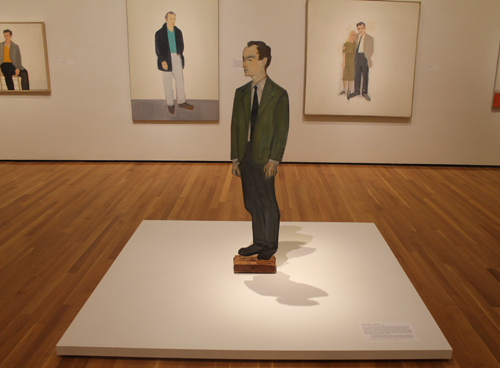 Organized by the Colby College Museum of Art in Waterville, Maine, in close collaboration with Katz, this presentation explores the first decade of the artist's career, a period characterized by fierce experimentation from which his signature brightly colored figurative paintings emerged. When you title an exhibit so boldly - Brand-New & Terrific - you better be able to back it up. 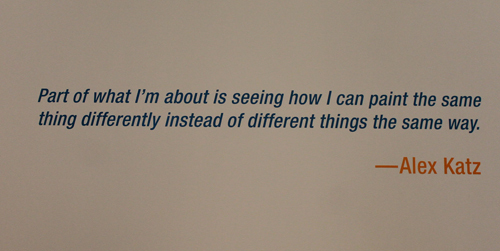 And the Alex Katz exhibit certainly does. I knew nothing about the artist and little about the style and period before perusing this exhibit. It whet my appetite for more. The exhibition's title derives from Katz's early manifesto announcing his intentions to invigorate traditional artistic subject matter. Creating work at a time when abstract painting dominated the art scene, Katz forged an ingenious way to wed abstraction with recognizable imagery by paring down his compositions to their most fundamental elements. In retrospect, these works prefigured the subsequent development of Pop Art. The exhibition includes more than 80 key loans from public and private collections, including many rarely seen works from the artist's own holdings as well as a sampling of Katz's works from the CMA collection. 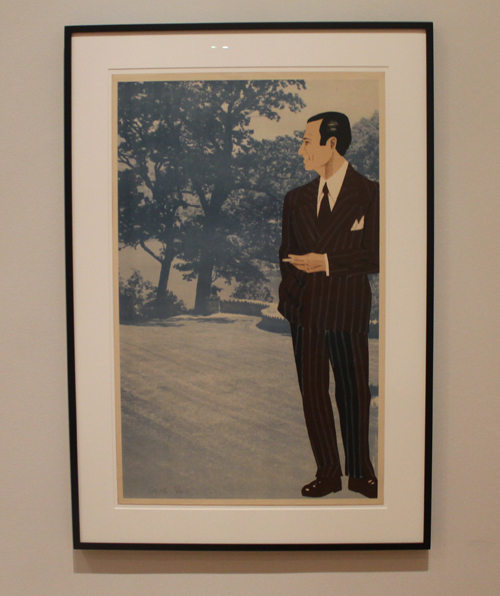 The exhibition shows the various media that Katz employed - oils, watercolors, painting on linen, collages - even cutouts. In a free program on May 12 at the Cleveland Museum of Art, the artist will talk about his early works on view in the exhibition. 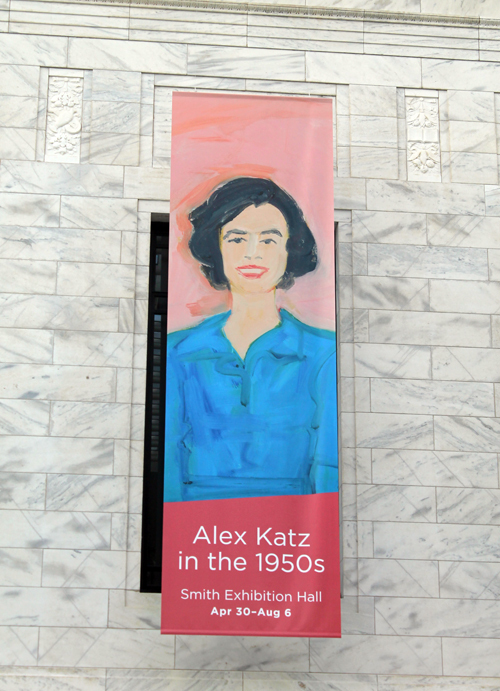 Brand-New & Terrific: Alex Katz in the 1950's is on view in the Kelvin and Eleanor Smith Foundation Hall at the Cleveland Museum of Art April 30 through August 6, 2017. 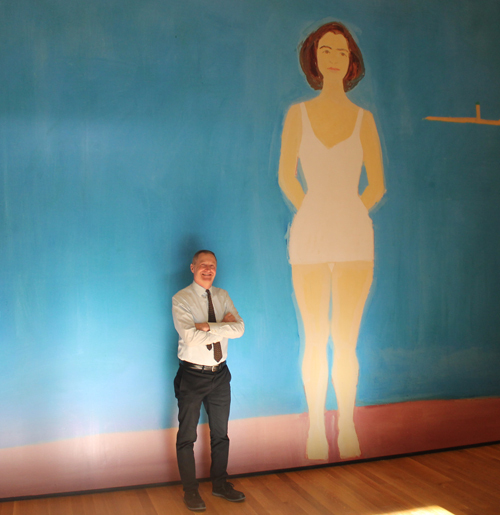 "We are thrilled to present an exhibition on the work of Alex Katz, one of the most acclaimed artists working today, "said William Griswold, director of the Cleveland Museum of Art. "The exhibition celebrates an experimental period for the artist and provides a rare opportunity to view works from his momentous first decade." Born and raised in New York, Katz studied at the Cooper Union in the late 1940s and then attended Maine's Skowhegan School of Painting and Sculpture in 1949 and 1950. There, the artist first began to paint from life and found the subjects he would depict for years to come-the Maine landscape, his circle of friends and domestic interiors. An examination of this pivotal decade, Brand-New & Terrific: Alex Katz in the 1950's presents a stunning collection of groundbreaking paintings, cutouts and collages that laid the foundation for the artist's mature style-the vibrant palette and vivid placement of a figure against a solid ground-that emerged toward the end of the decade. The works on view in the exhibition provide a fascinating look at a young, thoughtful and ambitious talent developing his style for a successful career. "One of the many things I love about this exhibition is the opportunity to see an immensely creative mind at work," said Mark Cole, curator of American painting and sculpture at the Cleveland Museum of Art. 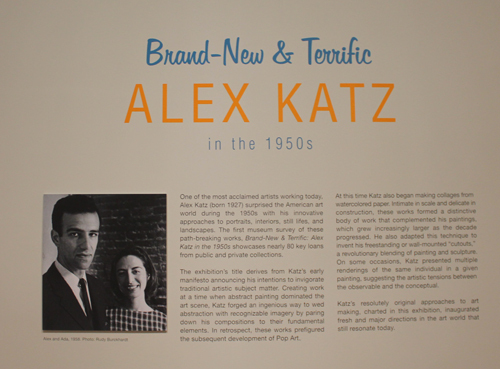 "Katz's innovations during the 1950's came fast and furious, and through this choice selection of paintings, collages and cutouts, we can witness the artist's astonishing development. Ultimately these works of art are marvelous, as visually appealing as they are thought provoking." Like many of Katz' work, the model is his wife Ada del Moro. 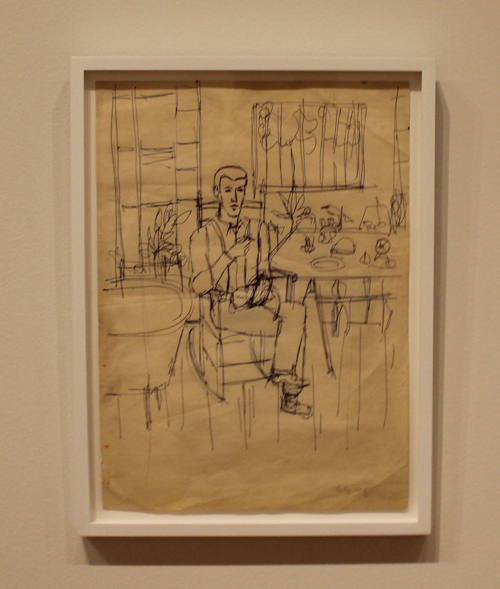 During an early phase in the 1950's, Katz turned to found photographs as a source for painting and studied amateur black-and-white photographs in order to analyze their visual cues. This process energized him to paint broadly, while blocking out forms, adding colors and omitting details-all in the service of augmenting the pictorial flatness and stillness he admired so much in the original source material. In 1954 he began making collages from water colored paper, inspired in part by the cut-paper constructions of Henri Matisse. Intimate in scale and delicate in construction, these works formed a distinctive body of work that complemented his larger paintings. By the late 1950's, Katz adapted this technique to invent his freestanding or wall-mounted "cutouts," a revolutionary blending of painting and sculpture. 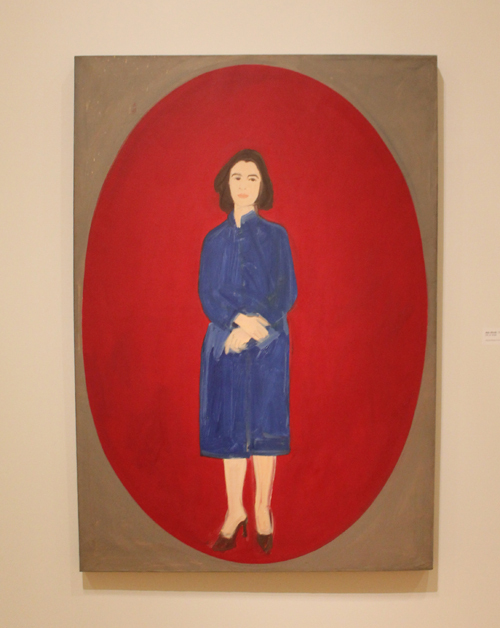 Unique to the Cleveland venue, Brand-New & Terrific: Alex Katz in the 1950's features an additional gallery highlighting later works by Katz from the Cleveland Museum of Art's permanent collection. Dating to the 1960s and '70s, these objects are anchored by the monumental canvas Impala from 1968. Impala measures about 9' x 6' and is a monumental canvas occasioned by a drive through the mountainous landscape of Utah. 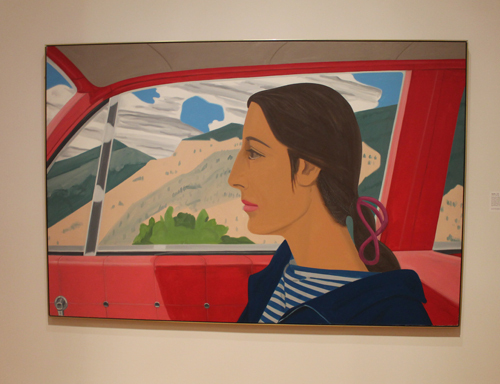 The painting�s point of view approximates a driver�s quick sideways glance, showing viewers the profile of Katz�s wife Ada del Moro immersed in thought as she sits next to him in the titular Chevrolet. 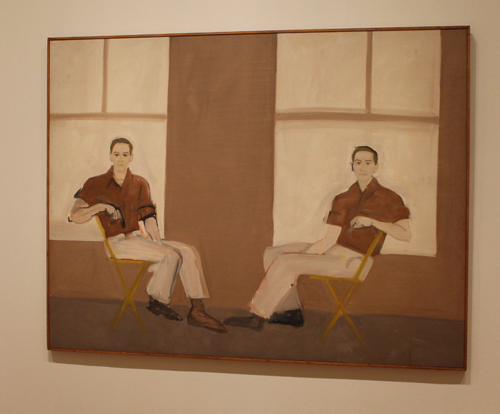 I liked the pieces that featured more than one image such as Ada Ada and the Double Portrait of Robert Rauschenberg. Also featured are six prints by Katz in various media-incorporating portraiture, landscape and still life-demonstrating the great extent to which the artist's work from the 1950's informed his subsequent career. 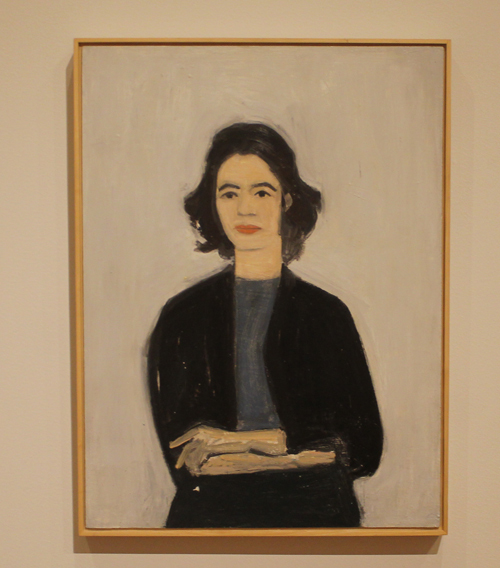 Brand-New & Terrific: Alex Katz in the 1950's opened at the Colby College Museum of Art in July 2015, and is curated by Diana Tuite, Katz Curator at Colby. I was lucky to be able to ask Diana Tuite some questions for this video. I think it's an interesting exhibition for summer and will be popular. 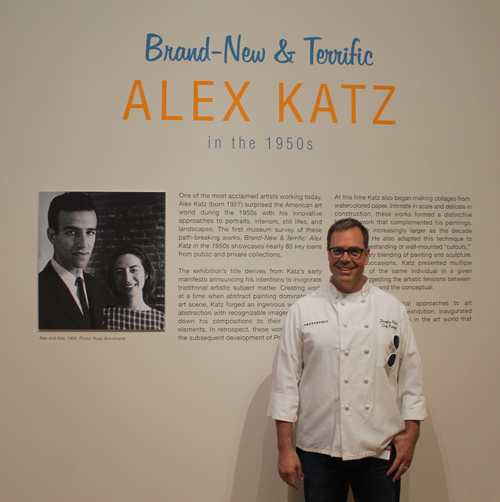 And where else but the Cleveland Museum of Art can you find a double dose of Katz - Alex Katz and celebrated chef Douglas Katz. Chef Katz is the culinary force behind Provenance, Provenance Caf�, and Catering by Provenance, a three-pronged dining concept. The exhibition runs from Sunday, 04/30/2017 to Sunday, 08/06/2017 in the Kelvin and Eleanor Smith Foundation Hall.